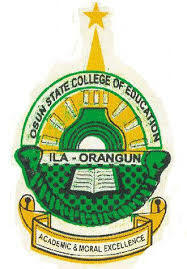 Osun College of Education Ila-Orangun [OSSCEILA] Affiliate to Ekiti State University, EKSU Degree [POST-UTME/DE/Change of Institution ] Admission Forms, Courses, Admission Requirements and Application Guidelines for 2018/2019 Academic Session. iii. Candidates must have written and passed the 2018 UTME conducted by the JAMB. iv. Candidate’s score at the last UTME (2018) must not be less than the prescribed national cut-off mark i.e. 150.
v. Success at the post UTME screening exercise to be conducted by admitting college. iii. Admission of Direct Entry Candidates is however, subject to success at the Post UTME Screening exercise to be conducted by the admitting college. iv. Three passes at the advanced level GCE with SSCE/GCE O’ level credit passes in two other subjects including English Language. ii. Post UTME screening will be done on-line. iii. Any further information required may be obtained from the Directorate of Continuing Education Programmes, Ekiti State University Or the admission officer (08062574391).